Glad to hear you got to do some good work around the globe. Was this all for the Polish production or more ? I may have a bit of news in the next couple of months, but it won't be as exciting compared to what you and Melv have been doing. Enjoy your break and have a drive, walk the dogs. Or, hit two stones with one bird and drive the dogs around ! Ha I really laughed at that pic Vin. 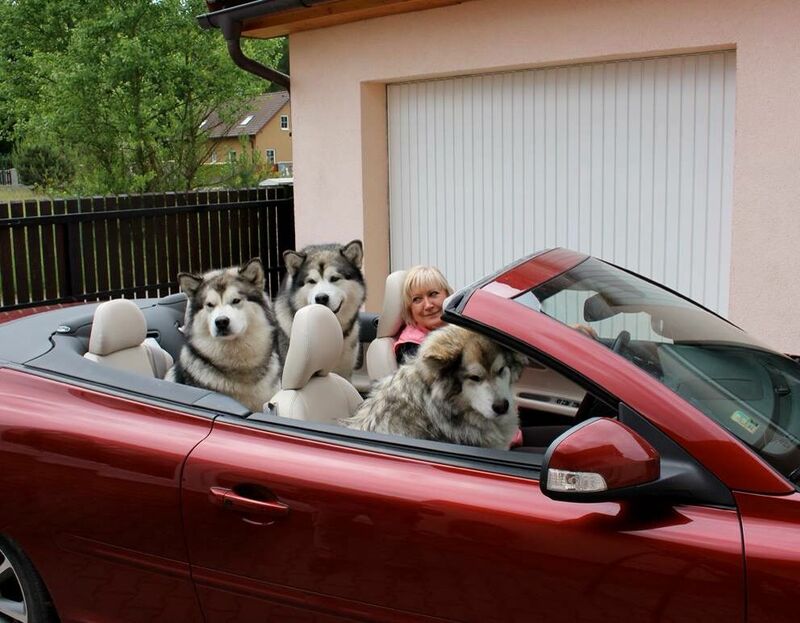 It is so like the Malamutes to ride around like that. Mrs Strato takes our one also in a convertible much to my dislike as they have feet like Clydsdale horses and scratch the leather interior. But hey if it keeps Mrs Strato happy then that's a good thing. Late to the party, as usual . . . Welcome home Starto. Remind me not to do this move thing again - I could leave so much here or to a thrift store, but appears we are moving 90% of everything we've ever owned - sigh. More later when I get out of the garage - sheesh, what a lot of junk I accumulated. Hey Mel, yes I'm always late to the party but that's just me. Mel I sympathise with your moving having done it many times. These days I just leave everything where it is and pick up when I get back. I have lived so globally over the years so difficult to call anywhere a permanent home. What made you decide to move? More relaxed lifestyle or family etc? I have to relate a funny story that happened in the UK last year as I saw a photo today that reminded me of the experience. I had a meeting in Crewe and arrived at my Solihull hotel on the weekend, the plan being to drive to Crewe on the Monday morning. I had nothing to do and was bored so called a friend that has close connections to a large prestige car manufacturing company in the hope that some motoring event was on somewhere nearby. My friend advised that no motoring event was on that weekend but they were sponsoring a tent at the Henley rowing regatta and I would be more than welcome to be their guest. All I had to do was present myself at the gate and mention his name. I thanked my friend and headed down to the river bank address provided. On arriving I noted that the river banks were all covered with nice green hoardings but I could see corporate tents and nice looking grandstands. Strato thought this will be a relaxing afternoon with free drinks, nice women to look at and food. Strato could pretend he was interested in rowing and could cheer with the best of them even though he had no idea who he would be cheering for. So full of energy (more like full of himself) eagerly strode towards the designated corporate sponsored gate. (Sponsor not named to protect the guilty). Strato announced his arrival and was greeted by a pimply faced young man with something clearly stuck in his throat, (probably a plumb) and wearing a very nice "clean looking" boater hat. The pimply one uttered some guttural "Oxford like" narration as he looked Strato up and down clearly with distain. Eventually declaring to the bemused Strato that he could not possibly let Strato in the gate as he was wearing "Loafers" and was not suitably attired to attend their function. In typical Strato style he pushed past the pimply one accidently knocking off his boater, but made every effort to tread on it as he went past. With Pimply in hot pursuit Strato made for the tent and fortunately was welcomed by some others that recognised the older long haired has-been. lol, I jest! Pimply face looked very distraught with his much prized boater hat looking a little worse for wear and retreated to the corner of the tent to probably make repairs and treat his damaged ego. However Strato's Loafers by comparison looked resplendent in the afternoon sun. 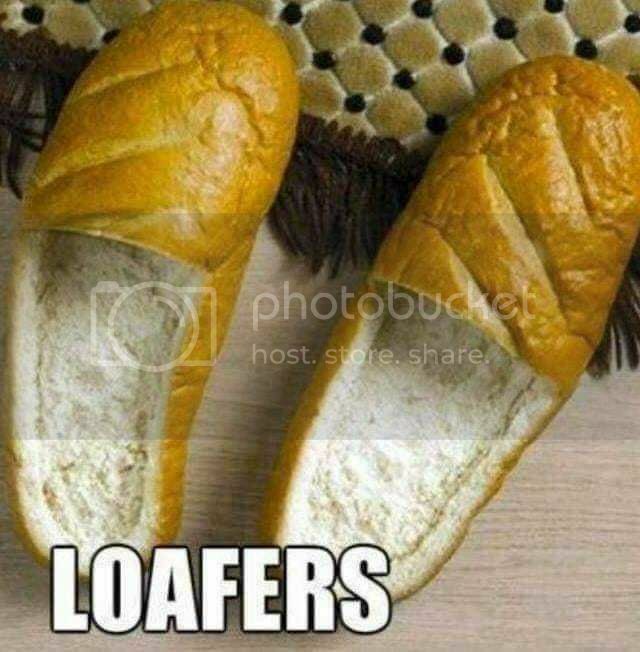 A much enjoyable afternoon then took place and Strato finally had to be driven back to the hotel by an attractive advertising lady that didn't seem to mind the Strato dress code or his Loafers. Hey Mel, yes I'm always late to the party but that's just me. Mel I sympathise with your moving having done it many times. . . .What made you decide to move? More relaxed lifestyle or family etc? I meant me Strato - I'm the one who is/was late, but it's nice to know, I'm not alone. To your question, the answer is Yes and Yes. Where we are moving to is very laid back - lots of artsy people, an outstanding music school, a very hip town, but are far enough away from the hubbub. 4+ acres on a street with 11 houses and only one neighbor we can see - Ahh, should be nice. Where we live, neighbors are only a driveway away and we are three houses of a very busy road, plus planes that come into the metro airport are just way to low and frequent. So that's the lifestyle part. The family part is my wife has been a care taker for my mom, her mom, my aunt, her dad and three neighbors - she wanted to be close to her dads second wife to be able to assist her when needed . . she's 86 and she could very well last longer than us, but we wanted to be close. It snowed 6 inches two days ago and is supposed to see another 6 or 7 tonight. That is the only thing that doesn't excite me, but I'll learn to deal with it. Mel are you looking forward to the new city or do you have reservations about the move? It's always difficult parting with long term band mates, thats what I would find the most difficult. I found I missed the camaraderie just as much as the music we made. But life goes on and we all eventually go our seperate ways. I find myself these days reflecting more on the early days which probably is a bad thing. A new beginning can be exciting and new friendships formed, so good luck with the move and stay in touch.
. That's quality Strato content I was hoping to read again ! Thanks for the good laugh, I needed one. The Malamute is an amazing breed, does yours have the winter coat on already ?